Mrs. Maribel “Mollie” (Diffenbach) Singleton, born on July 2, 1923 in Lancaster, Pennsylvania, to the late Violet Troup Diffenbach and the late Martin Zimmerman Diffenbach, passed away at age 95 on July 22, 2018. Mollie graduated from Manheim Township High School in 1942. Mollie was the beloved wife of the late Mr. Edgar Rhoads Singleton. Mollie and Ed were high school sweethearts and were married for 67 years prior to his passing in 2011. Mollie was a resident of Conestoga View Nursing Home for over ten years. Her family walked every year in her honor at the Lancaster Alzheimer’s Walk as “Mollie’s Gang” to help raise money for Alzheimer’s awareness. 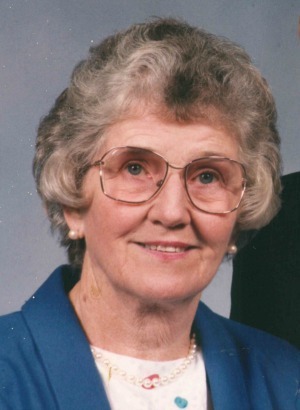 She was preceded in death by her sisters, Norma Singleton, wife of the late Robert L. Singleton; Audrey Hauser, wife of Charles “Bud” Hauser; and Ellen (Becky) Powl, wife of the late J. Frank Powl. Mollie is survived by her two sons, Edgar Robert Singleton and William Martin Singleton and their wives. Mollie is also survived by her eight grandchildren, one adopted grandchild, 16 great-grandchildren, and three great-great grandchildren. She was a longtime member of the First United Methodist Church in Lancaster City. I am so sorry for your family’s loss of your beloved Mollie. In the difficult days ahead, I hope you will find comfort in happy memories. Revelation 21:4 says that soon ‘death will be no more, neither will mourning, nor outcry, nor pain be anymore.’ We have the promise of seeing our loved ones again in a world with no more suffering. I wish the very best for your family at this time, take care. John and I are very sorry for the loss of Mollie Singleton and will pray for your family. Bill. So sorry to hear of your mother’s passing. It has been a long road traveled toward that final destination. I am undergoing that same situation with Darlene. My prayers are with you friend.